In the tradition of the bestselling Alchemy of Herbs, The Complete Guide to Adaptogens details the benefits of twenty-four adaptogenic herbs, and includes more than seventy-five recipes that target specific wellness categories such as sleep, mental focus, beauty—and more! Adaptogens are a unique class of herbs that greatly improve your body's reaction to emotional and physical stress, while also increasing your energy, stamina, endurance, and mental clarity. Recent studies support what practitioners of Indian Ayurveda and traditional Chinese medicine have known for centuries—these herbs such as Rhodiola, ginseng, licorice, and more, have many heath and wellness benefits and are safe for long-term use. Whether you're interested in honing your mental abilities to a razor-sharp level, want to boost your athleticism, or are looking for ways to elevate your healthy lifestyle, adaptogens have so much to offer for everyday well-being. In The Complete Guide to Adaptagens, you'll learn about the numerous benefits of twenty-four popular adaptogenic herbs, including Rhodiola, Ashwagandha, Maca, He Shou Wu, and Holy Basil. You'll also find more than seventy-five easy recipes for potions and remedies to improve sleep, mood, mental focus, immune function, stamina, as well as general wellness and beauty. These all-natural, safe remedies fight the effects of chronic stress, while restoring your body’s balance, health, and vitality. "I love this book! I feel so blessed to have been able to review it and share my opinion. The Complete Guide to Adaptogens is a welcome addition to my personal herbal library. If you are trying to improve your health with herbs, using adaptogens is a great way to start. This book will help give you a great overall background in herbs that are excellent adaptogens, tons of great recipes that are easy to use, and information and ideas you can easily integrate into your daily life for ultimate health. Additionally---this book is just gorgeous! It's beautifully bound, and the pictures are artfully created. It's hard to stop looking at it!" "The Complete Guide to Adaptogens is an amazing resource for any herbalist, and also for anyone who wants to learn more about being self-sufficient with natural and homemade remedies. Like most good books, it has you craving MORE: more information on adaptogens, more information on all herbs, etc. 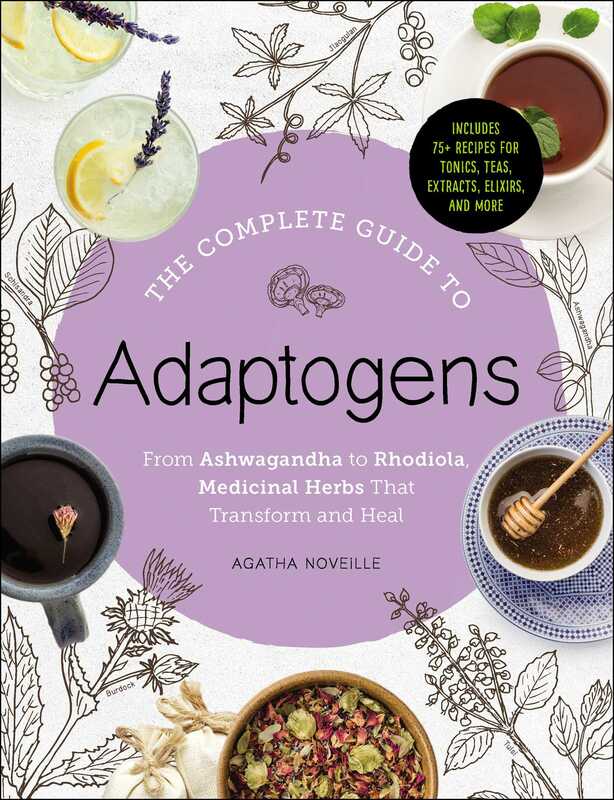 And, like most good books, The Complete Guide to Adaptogens will leave you feeling INSPIRED. There is seriously such a huge range of creative recipes that will keep you inspired for a long, long time. I loved this book, and I hope you will, too." "A comprehensive and informative guide into the world of adaptogenic herbs. This book was a great guide to learning how herbs and simple remedies can be used to bring the body to wellness." "Agatha Noveille knows adaptogens from first-hand experience. Her new book, The Complete Guide to Adaptogens is a fresh, modern handbook to twenty-four of these super-relevant-to-our-lives herbs, with recipes to show you how to make your own tinctures … or put to use in delicious drinks and more." "In her new book, The Complete Guide to Adaptogens, Agatha Noveille shares over 75 recipes that will help your body heal and be supported on many levels … this full color book has it all. Many delicious recipes … are included. As an herbalist writer at Indie Herbalist, Agatha has the knowledge and expertise with herbs to guide you… Beautiful to look at, easy to read and understand and not just the standard … recipes that are often seen. This book has real life, easy recipes that your family will truly enjoy, with herbs that are easy to find!" "This book was a great guide to learning how herbs and simple remedies can be used to bring the body to wellness."